TYPE AND USE: Perennial vine with edible fruit and leaves and flowers for use as sleepy-time tea. HABIT: Large, deeply cut leaves, climbs quickly by tendrils. Blooms almost all summer with spectacular purple and white flowers. Native from East Texas to Florida. The introduced varieties also have dramatic flowers, but most are not winter hardy. CULTURE: Easy, any soil, drought tolerant. Dies to the ground each winter but returns in spring. USES: Summer climbing vine, flower display. PROBLEMS: Can spread and be seriously invasive. PLANTING DATES: Spring and fall, but container-grown plants can be planted any time. SEED EMERGENCE: Don’t know. We’ve never grown it from seed. HARVEST TIME: Year-round from containers. Spring and fall are the best times. GROWTH HABITS: Beautiful, although aggressively spreading vine with deeply cut foliage and colorful and intricately detailed flowers. Several different flower colors are available. Climbs by tendrils. Blooms all summer. CULTURE: Easy to grow in any well-drained healthy soil. 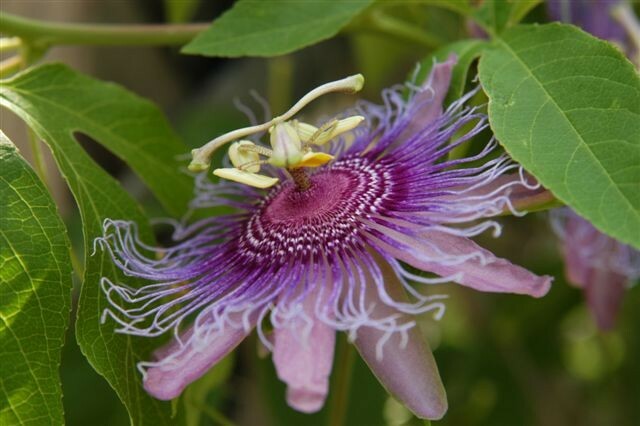 Passion vine dies to the ground and returns in the spring, although there are many tropical choices as well. TROUBLES AND SOLUTIONS: Most common pest is the Gulf fritilary butterfly larva. These butterflies are beautiful, so let them have some of the foliage. Hand pick if they become too plentiful. They’re slow and easy to catch. HARVEST AND STORAGE: Harvest the foliage and flowers any time to use in teas. The fruit should be harvested after it matures. The color of ripe fruit ranges from yellow to red. Be careful, the fruit of some varieties tastes pretty bad. PRUNING: is best done during winter months, when the plant is not actively growing. All dead and weak growth should be trimmed back to healthy stems leaving several nodes each to promote vigorous growth in the spring; strong stems should be cut back by at least one third. As passion flower is susceptible to some viral diseases, shears should be thoroughly disinfected before and after pruning. If your vine is overwintered outdoors it will usually die back to the roots. If any top growth remains, you can trim it to 8" to 12" from the soil. Clean off all dead growth from last year. Most passion vine in upper zone 8 and north will die down to the ground. Then it re-sprouts from the roots in the spring. In lower and protected areas of zone 8 and south, plants may stay evergreen - in which case plants can get very large. In these cases, occasional pruning will need to be done if you need to keep the plants in bounds. NOTES: As with all the plants, don’t eat unless you grow them with organic techniques. 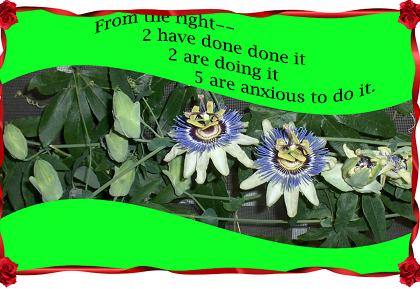 For more information, read Passion Flowers by John Vanderplank. 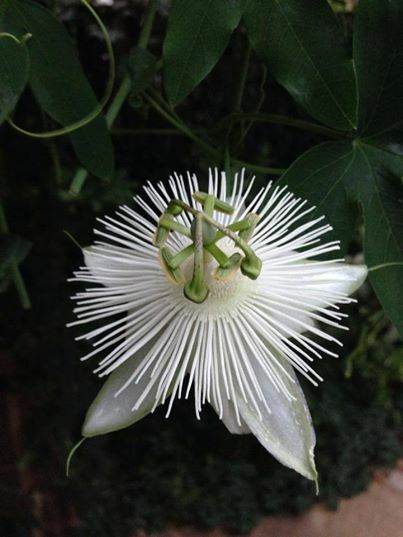 A day in the life of a passion flower.